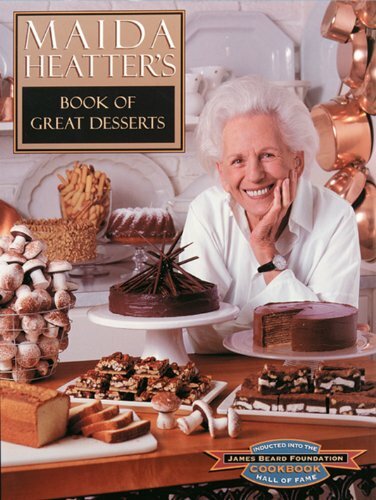 Inducted into the James Beard Foundation Cookbook Hall of Fame, Maida Heatter's Book Of Great Desserts is an impressive compendium of wonderful recipes for topping off any meal wether it be ordinary daily dining with the family, special celebratory occasions, or when the urge for something delicious when our sweet tooth beckons. From Palm Beach Chocolate Tube Cake; Buttermilk Spice Cake; New Orleans Oatmeal Cookies; and Swedish Dream Cookies; to Pineapple and Strawberries Creole; Apricot Sherbet; Ice Box Rice Pudding; and Pots de Creme au Chocolat, Maida Heatter's Book Of Great Desserts fully lives up to its title and clearly documents why Maida Heatter has won nearly every honor possible for a writer of cookbooks. If you only own a few cookbooks make this one of them! I bought this book years ago when I was first learning to make desserts. All sorts of crazes have come and gone since then but these desserts have never gone out of style. I have made Maida's two different chocolate mousse recipes for the same party, and let the guests pick which type they preferred, dense and deeply chocolate or lighter and creamier. Everyone had a preference! The strawberry bavarian is easy to make and a real crowd pleaser, as is the Queen of Sheba Torte. I treasure my old battered and stained copy of this book, and should buy a new copy to hold in reserve. My other absolute favorite dessert book is Classic Home Desserts by Richard Sax. 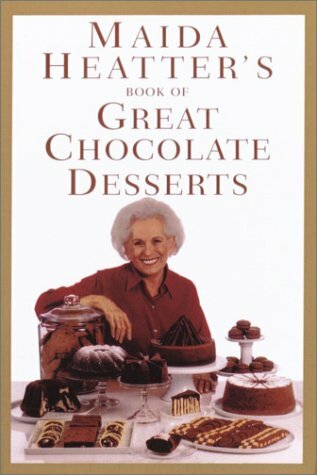 While I like her "Great Chocolate deserts" cookbook better, I have made some of the stuff in this book without a miss. My favorite is the Crepe recipe. Simple and elegant, tasty and they always come out. An absolute must-have for anyone who loves desserts! What sets this fabulous cookbook out from others is the charming and talented Maida Heatter. Not only does she take you through each recipe and explain in great detail the method and reasoning, she provides a lovely anecdote to savour along with the scrumptious desserts. Under her expert tutelage, I have mastered beating egg whites and all that entails, and can now enjoy decadent treats like chocolate mousse and fresh ladyfingers - the most divine cookie I have ever had the pleasure of removing from my oven. This is a fantastic find!!! This durable classic was written by one of the better known names among American cookbook authors, who apprenticed with James Beard and supervised the rewrite of the Fannie Farmer cookbook. The book endures by providing a super coverage of a neglected culinary subject. 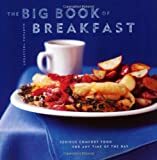 While there are dozens of books with chapters on breakfast dishes, there are only a small handful of books devoted exclusively to breakfast written in the last 20 years. This book, neatly typeset, edited, and designed by the Alfred A. Knopf crew, should grace your shelf for a long time, even if your space is limited. Yeast breads such as American White Bread. Toasts, French Toast, and Breakfast Sandwiches. Quick Breads such as biscuits, cornbread, scones, muffins, and fruit breads. Fruit Fixing, as in applesauce, poached apples, stuffed pears, fresh juices, rhubarb, pineapple, mango, etc. Some reviewers have stated that her recipes are easy. While this may be true of most topics above, it is not true of yeast breads. Even the simplest recipes, and Cunningham's are relatively simple, require a modest amount of skill and a fair amount of time, so I must say that Cunningham is more concerned with good recipes and completeness than she is with speed. While Miss Marion covers all the bases, some are covered a lot better than others. The yeast bread chapter has only a few samples and an exceptionally picky person may feel that the book suffers by not having a brioche recipe, as this is a perfect ingredient for French Toast. I will only point this out and generally suggest that if you are serious about making bread, check out either 'Baking with Julia' as an excellent general introduction to baking or Rose Levy Beranbaum's 'The Bread Bible' for the straight skinny on everything bread. For the very best Southern biscuits, check out Nick Malgieri's 'How to Bake'. The coverage of eggs and toast and condiments and cakes and custards and puddings and pancakes is terrific. This represents the strongest reason to own a copy of this book, if you are especially fond of leisurely weekend breakfasts or brunches. There are dozens of recipes for things I knew people did actually eat for breakfast, but never came close to having them myself or even seeing them on restaurant menus. As with the bread and biscuit recipes, do not believe Ms. Cunningham has absolutely covered all bases in chapters such as Meats and Beverages. She does not always cover the most common recipe for a dish. A perfect example is her creamed chipped beef recipe that includes mushrooms. A classic recipe would not include mushrooms and would include Worcestershire sauce and a little cayenne. This aside, this book packs an enormous punch with 288 recipes for a list price of $20 and an Amazon discounted price of $14. Very highly recommended, especially for a modest budget and a big appetite for big breakfasts. This cookbook is fabulous. I have given as gifts numerous times, and have been told by each recipient that it is the favorite cookbook! I have even bought this cookbook used to give as a gift when it was out of print for awhile! The pancakes and waffles are terrific, and the other recipes are great, lots of new and old things to try. I am a collector and I have one thing to say: Buy it! This is a must have cookbook! As a student, I find this book FAN-TAS-TIC with a capital F. I just threw a biscuit and gravy party at my friend's house in WeHo, everyone loved it. Thanks Marion! I just loved the fantastic recipes. Easy as pie to follow, yet the dishes turn out restaurant quality. My husband says this is the best eating since our bed and breakfast tour of Sonoma/Napa. Easy and simple recipes even for a 29 year old bachelor! Slightly older egg whites--the ones from supermarket eggs are already three to five days old by the time you buy them--whip up smoother and higher than fesh ones. This bit of information introduces the section called Magical Meringues in Roland Mesnier's Dessert University. For 25 years Roland Mesnier has been executive pastry chef at the White House. He's also a teacher who never forgets what it is to be a student. So he's ready, willing, and able to share what he has learned about producing desserts to die for. There's a gentle, encouraging spirit that runs through this book, and it comes from the unique situation a White House pastry cehf finds himself in. On the one hand he has to prepare high-end restaurant-quality desserts for lunches and dinners that seat people by the hundreds. But the chief responsibility is to a single family and its guests, which makes the work more like a private chef who only has to satisfy one customer. So these are family recipes, in a sense, that can stand up to restaurant specs. The book opens with a chapter on fruit desserts, a chapter that establishes a simple, user-friendly line. What follows are chapters on Puddings Custards and Souffles; Mousses and Bavarians; Frozen Desserts; Meringues; Crepes and Deloctable Fillings; Breakfast Pastries; Cookies; Tarts and Pies; Cakes; Chocolate Candy and Decorations; Sugar Decorations; and Syrups, Sauces, and Glazes. A great cookbook idea for a novice, new couple, or serious breakfast lover. It will encourage people to spend more time with a good breakfast, and perhaps with each other! If you don't eat eggs, this book offers delicious alternatives (hot oatmeal with nuts,etc., meats, breads, even tofu dishes). If you love eggs, this book is a rich resource. I appreciate that in addition to recipes to be made while everyone is waiting (scrambled eggs), she includes recipes to make the night before, make a few hours before, etc. This is an attractive cookbook with very easy-to-follow recipes and instructions. Her 'serve with' suggestions are for recipes also included in the book. Bette Hagman's four cookbooks have sold more than 220,000 copies and established her as the leading expert in the ever growing market of gluten-free cooking. She is the premier creator of recipes for those intolerant to gluten and for those allergic to wheat. 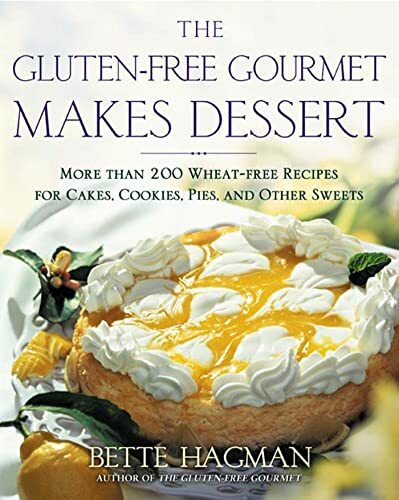 In the latest addition to the Gluten-free Gourmet series, Hagman turns her hand to that most loved part of the meal, dessert. At the core of this book are more than two hundred easy-to-follow recipes for delicious cakes, pies, cookies, puddings, and other sweets, including Chocolate Peanuty Cupcakes, Raspberry Bars, and Gingersnaps. The nutritional information and dietary exchanges that accompany each recipe will make these desserts fit easily into any diet. Hagman also answers common questions about gluten-free baking and provides a list of sources for gluten-free baking products you can order by mail. With The Gluten-free Gourmet Makes Dessert no meal will have to end without dessert again. Yummy treats are ours again! After recently discovering I am allergic to wheat/gluten I have been trying the alternatives pre-made at Whole Foods, my local Health food store. That adds up. I have always enjoyed baking and missed that as well. Bette's books satisfy me in both areas. I can now bake again for myself and after the initial investment of the flours, turn out treats for much less than the pre-made items. Waffles, bread, cookies..yum! I have successfully substituted soy milk for any dairy in her recipes since that is an allergy too. If you are gluten free and debating the purchase of this book - I say go for it! For all gluten-free cooks -- especially kids! opens up your world a little. And these recipes do work; some are complex, many are very simple, which means the book answers a range of cook's skills. While it is true that the recipes are based on mixes made from a wide range of sometimes exotic flours -- usually available through an American health food store -- it's not fair to condemn any of Bette's books for this. You're just not likely to find most gluten-free flours for cheap in your grocery store, at least not this early in the millennium. My 11-year-old daughter has adopted this book as her kitchen companion. She turned out a wonderful cake on her first try. For those of you with children stuck with a gluten-free diet for life, there is no more essential skill to pass on to them than cooking -- and no better passion than a love of cooking -- that will support them through a lifetime on a specialized diet. 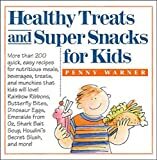 This book makes a great starting place for cooking with kids, as well as being a suitable cookbook for adults of all skill levels. Those of us following a gluten-free diet often feel something akin to claustrophobia when it comes to food. Every day we're faced with so many goodies that we can't have. It's a great comfort to have a resource like this one at home when you walk past the bakery section of your local grocery store. Just knowing you *can* go home and bake something sweet and tasty opens up your world a little. 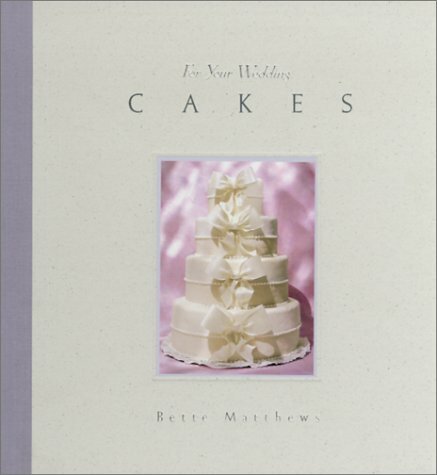 I think if you are trying to figure out what kind of a cake you want for your wedding this is a very helpful book. The cakes are beautiful and varied. As a pastry student I found it very helpful as far as getting ideas for my wedding cake project. I like the fact that there are formal and informal wedding cakes. Someone reviewing commented that some cakes were "sloppy" but many people prefer less formal cakes and this gives you plenty of both for ideas. This is a great book, if your looking for ideas. The pictures are beautiful and inspiring. It does not have any instruction on how to make these cakes, therefor, it seems best suited for someone looking for an idea to present to their local baker, or someone that has intermediate to advanced cake decorating skills. I have to be honest, I wish that I would not have bought this book. I bought it because I was under the impression that I was going to see classy cakes like the cake on the cover. When I opened the book I was confused. Page after page were pictures of sloppy cakes. There are only a few pictures out of the entire book that are worth seeing, for example Margaret Braun's cakes at the tail end of the book. Get her book before you buy this one! This book is very good for getting ideas of different designs for your wedding cake. If you'er looking for a more instructional book on how to decorate the cakes, this book is not it. However the pictures of the cakes are beautiful with little or no information about the number of servings, decorations etc. It is exactly what it says Cakes for you wedding. Just a book of pictures for ideas. If this is what you're looking for then this book will do. 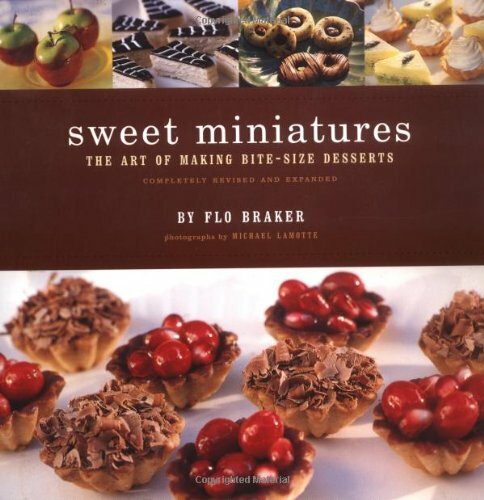 really a must have if you are interested in making the finest miniature desserts. flo knows this stuff inside and out, and is able to come across like a good friend rather than an expert know it all (even though she happens to be one) . the forward and notes serve as calming and helpful tips to ensure the reader that everything will be ok. the recipes are flawless and convey potentially tricky terms and situations with ease. what more can i say, its the petit four bible: GO FLO~! Great book. Some of the recipes are labor intensive but well worth the trouble. Tried the Pineapple Pockets, Little Gems, Peanut Butter Petals, all excellent. The Shortbread Cameos fell flat in both taste and appearance. If you are a cookie fanatic like me, this is a must have. I received the hard bound version of this book as a present many years ago. It is now the secret behind my annual Christmas party for which I prepare over 2000 tartlets, pastries, cookies and candies. The recipes are superb and largely unduplicated in any other books I've seen. Instructions are detailed and clear. My guests are always clamoring for recipes. The original hard bound book had to be replaced because it was so worn out. Warning: Some of the recipes are more difficult than they appear (Gianduja cubes). But overall, you'll find great hosting success with this book. I like this "little" baking book very much. It is an entire book dedicated to the magic art of petit-fours, or small, french, bite-sized bits of desserts and sweets. There are some books on the subject, mostly professional. However, here is a simple, easy to follow book ideal for the home baker to make these wonderful little things. 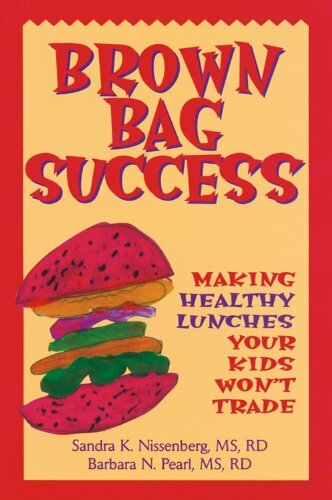 The author has been a successful caterer for many years. She knows what is easy to make, and are also very popular things that people just love. Here is a collection of those recipes that meet both requirements. It is a baking book you will probably use very often. Be warned, however, that these wonderful little gems are very labor intensive. You will be slaving over the proverbial hot stove for rather long perions of time per recipe. Multiply that by three or four recipes, and it all adds up to a very long time. Fortunately, the author supplies proven, time-saving organizational tips in the last chapter. I also note that her hints and suggestions for decoration can be skimpy at times; decorating things this small is not an easy task. My complaints are mostly organizational. Several basics, like cake or crust recipes, are used in multiple recipes, but are buried in the middle of chapters or embedded in one particular recipe. These should always be the first recipe in the relevant chapter on their own, or given a separate chapter by themselves. Also helpful would be a cross reference chart, so that one glance will tell you how many different petit-fours you can make with the same basic cake or crust recipe. It does have some charts at the end, but these are not organized by the base recipe. There are some pictures, and each one tells you what page the recipe is on; however, the reverse is not true: a recipe may have a picture, but you won't know it unless you check the pictures each time. Finally, delicious recipes for cookies, cakes, and other baked goods that use no eggs! Millions of people-- including 5 percent of all American children-- have a food allergy, and eggs are one of the most common culprits. 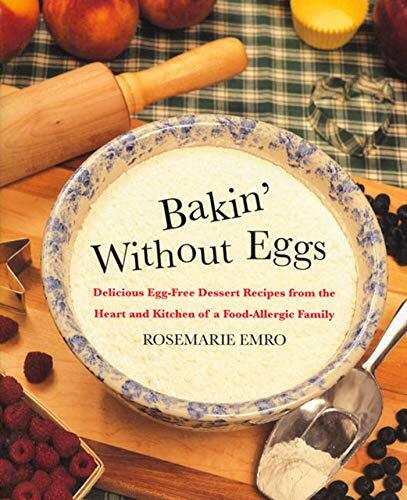 In this easy-to-use collection of recipes, Rosemarie Emro presents more than one hundred crowd-pleasing desserts and other treats that contain no eggs. These are delicious cakes, cookies, breads, muffins, brownies, bars, pies, and cobblers with all the flavor, texture, and delights egg-allergic families have been longing for. Everyone who wants to avoid eggs can now rediscover the joys of baking. With about 150 recipes in the book, and many variations possible for some recipes, you get a lot of dessert choices I didn't think would be possible for an egg-allergic family. Most recipes are easy, if time consuming, but all the recipes I've tried were excellent. My child's grandmothers have even borrowed some of the recipes so they can have sweets for my child when he comes over. I'm very glad I bought this book. recipe taste like the real thing! Just got this book for my egg and nut allergic boy. I was a frustrated former baker who had become egg-free to protect my son from anaphylaxis. The food allergy networks recipes were decent at best (what do you expect with no dairy or egg in a baked good). Just tried one of the banana bread recipes and it was great. Moist and not crumbly-astounding for egg free. You really couldn't tell the difference. I'm going to try more but I hit a winner the first time. A word of thanks to the author for making my little guy's life a little sweeter and more normal! Thank you, thank you Rosemarie Emro!! I can't believe I hadn't discovered this cookbook of yours sooner but better late than never! All the "allergy" cookbooks I've seen also assume that someone allergic to eggs is also allergic to wheat, dairy products and nuts - which I am not! It's soooo nice to see recipies that are JUST eggless! And don't have any odd ingredients that you have to get at a health food store. Unlike yourself or other reviewers of this book, it is not my child who is allergic to eggs, it is ME! (I have 2 children and neither have any food allergies). I am 44 years old and my mother and I have spent many many frustrating years trying to bake without eggs - believe me, it's not easy. I am DEATHLY allergic to eggs, can't eat 'em, can't touch 'em, can't even smell them cooking!! So many birthday parties when I was a little girl when I felt like a freak because I couldn't eat the birthday cake . . . so many buffets and dinner parties as an adult where there was maybe 1 or 2 things on the table that I could eat. I absolutely cannot wait to try every single recipe in this book! If you want any advice on growing up with an egg allergy, let me know! Thanks again for this great cookbook. 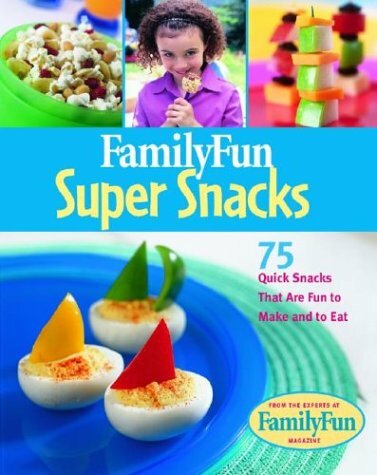 I've tried several of the recipes in this book and they were all great. Yes, the texture is slightly different than recipes with egg, but not bad, just different. The flavor of everything I've made has been wonderful! Yeah I can bake again! This book is fantastic. I use it all the time. I have 2 sons that are egg and nut allergic and its wonderful to have recipes at my fingertips that actaully come out tasting and looking great! I have tried a lot of the recipes in the book and my non-allergic friends and family ask me for the recipes. There are a ton of recipies to chose from, I have not made anything yet that I have been disapointed in. I dont even bother looking anywhere else now when I want a recipe. The choclate chip is great! This Christmas I made cookie press ones from the butter cookie recipe, I used imitation almond extract and it was JUST like the ones my mom made when I was a kid! I was so happy to be able to carry on the tradition. The sugar cookie one also works great. I have a hard time keeping up with my familys demand for the pumpkin and banana breads. I keep a stash of frozen chocolate cupcakes in the freezer at all times so if we go to a birthday party or other special event then my boys dont have to skip desert. The delectable treats turned out by Richard Leach--executive pastry chef of the Park Avenue Café and a James Beard Foundation Pastry Chef of the Year--are inspired, distinctive, and daring. 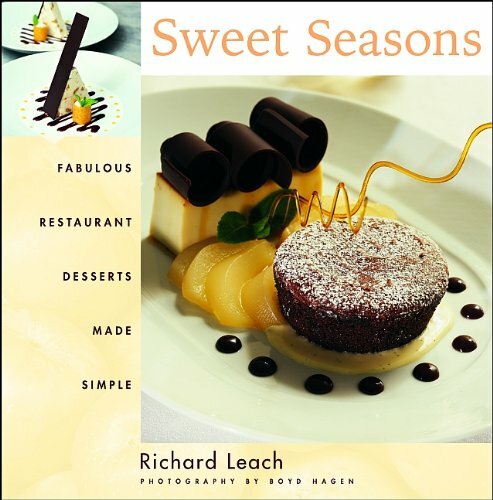 In Sweet Seasons, he aims to bring his masterful recipes to home kitchens everywhere. Known for his striking presentations, Leach states in the book's introduction that he would never be able to make his phenomenal desserts without the help of his staff, yet here he claims to make it possible for home cooks to re-create these masterpieces in their own kitchens. Truth be told, one would be hard pressed to find many home cooks who have the time, the patience, or the chutzpah to attempt dishes like Leach's Citrus Panna Cotta with Warm Poppyseed Cake and Citrus Sorbet. The dish, in its entirety, includes: Poppyseed Cake, Lemon Curd, Citrus Panna Cotta, Sour Lemon Meringues, Citrus Sorbet, Honey Tuiles, Orange Sections, Grapefruit Sections, Citrus Sauce, Cotton Candy, and Sugar Garnish, all of which are prepared from scratch. The good news is that many of the desserts are quite lovely--not to mention impressive--with most of the garnishes left off. For instance, in the above example, the Citrus Panna Cotta--delicately flavored with chamomile tea and lemongrass--is lovely served with a simple garnish of fresh fruit and a drizzle of the warm citrus sauce. If you're in the mood for extra flourish, you could add either the Honey Tuiles or the Sour Lemon Meringues for a little crunch. This book is a joke if you are interested in baking --even sophisticated bakers and pastry/cake decorators such as myself would be hard-pressed to find the ingredients (pistachio paste?) or the time to attempt any of these. Also it should be noted that while the concentration of this book is on presentation, NOT ALL OF THE RECIPES INCLUDE PHOTOS. So much for re-creating the recipe in your home kitchen. It is very entertaining, however, if you want to sit and page through it, at the library, as each page is more spectacular -- and astounding -- than the prior. These made according to Leach's specifications are of the utmost in time, skill and technique. However, as with most sophisticated chefs, the author here encourages us to only take what we want to bite off. Serve only a portion, use a presentation method with a totally different dessert, etc., etc. These function around carefully worked out organization, with numerous steps and components to architecturally outstanding multi-layered spectaculars! The collection is based seasonally around the very best of that time's ingredients. Such artistic mastery as" Walnut Tartlet with Chilled Spiced Cream and Golden Raisins; Pear And Pistachio Torte with Pear Fritters and Roasted Pear Puree; Glazed Ricotta Cheese Tart with Fresh Cherries; Chocolate-Espresso Cube with Chocolate Sorbet; Caramelized Banana-Mango Disks with Tamarind Sauce. Comparable to Charlie Trotters in complexity, however, not the demands on ingredients, as most of these are readily available to the interested home gourmet. Presentation is somewhat formidable, but instructive and gets one thinking about what elements to incorporate in one's own creations. Not for the weak of pastry accumen. One of the *BEST* Dessert books I have ever seen!!! A truly awesome book, with beautiful photography, inspiring recipes and easy to understand and reproduce recipes. However, I will say this clearly, this book was not intended for the 'Sunday Afternoon Easy-Bake-Oven Gourmet.' Many of the recipes in this book are the kind you'd expect to spend twenty dollars or more for at a fine-dining restaurant! I believe the author intended this book for the enormous army of professional chefs and pastry chefs that are out there these days, and not solely for the home cook. However, do not let this disuade you from trying this book! Many of the recipes in here oculd be simplified by removing a few non-essential components to a dish, while some of them could be made partially in advance and then completed at the last moment before serving! This sumptuous book succeeds for me on several levels. The artistry of the creations and beautiful photography are worth enjoying on their own merit. However, the greatest pleasure certainly comes from actually experiencing the creation, presentation, and deconstruction of these wonderful recipes. I disagree entirely with the remarks of some earlier reviewers who may be confusing 'complex' with 'time consuming.' I am an amateur cook but had little difficulty reproducing one of the more involved recipes using the author's directions. It did require 5 or 6 hours to prepare the 10 parts needed for the final construction, but the descriptions of the individual elements were so clear that they were indeed simple to make. Nearly all of them could be prepared one or two days ahead (the author clearly specifies which parts should be made at the last minute -- very few). The final constructions are well described and illustrated and the process seemed as entertaining to my guests as the eating. These desserts do take time -- but the final result is definitely worth it; and though the visual effect and interplay of different textures, flavors, and temperatures make it most rewarding to make the whole dessert, portions of each hold up well on their own. Last night, I impressed guests with the "Cherry and spice custard with warm financier" but the custard alone would have made an excellent dessert that would have taken less than an hour to prepare. I also found the process of making one of these desserts to be a cooking lesson in itself. By the time I finished one, I realized I had made spun sugar, a frozen souffle, perfect honey tuiles (with homemade stencils) a sabayon sauce, creme brule -- all for the first time. The author guides you through the steps in a way that makes organization natural- and the final construction straightforward. A final recommedation to readers-- The web sites in the back of the book have all the ingredients, molds, etc. used for the recipes. A little advance planning on the web can save considerable time driving around searching for a savarin mold (although a muffin tin worked nearly as well) or some other special item. Richard Leach's guide to the last course seems to make a number of promises in its title, foremost among them in my eyes was the âDesserts Made Simpleâ claim. I was expecting a how-to guide that would allow me to create dishes that had a balance of ease of preparation, in terms of both time and effort, and stunning presentation. Unfortunately, Mr. Leach seems to have forgotten that most amateur chefs, who I assume are the target audience of this book, do not have the luxury of a dedicated kitchen staff to assist in preparation. In truth, I have attempted four of the creations in Sweet Seasons, and not one of them took less than SEVEN hours from start to finish. Jeff MacNelly's "Shoe" is syndicated to more than a thousand newspapers and enjoyed by millions of fans every day.This new collection brings back all the favorite "Shoe" characters.New Shoes takes aim at the '90s, and MacNelly's sharp eye is right on target. This book contains way too many recipes with high fat items. It also doesn't contain the nutritional info for the finished items, which makes it useless to me. If you're thinking "healthy" means moderate to low fat/calorie, then this isn't the book for you! Should be called peanut butter snack book! I was hoping to find some help in the snack dept, as I have a limited variety of ideas for my partially food-allergic kid. He is allergic to a few items -- one happens to be peanuts, the other egg whites, but that's it. And unfortunately, 80% of the recipes in this book include peanut butter, nuts, or eggs! Nothing more original. 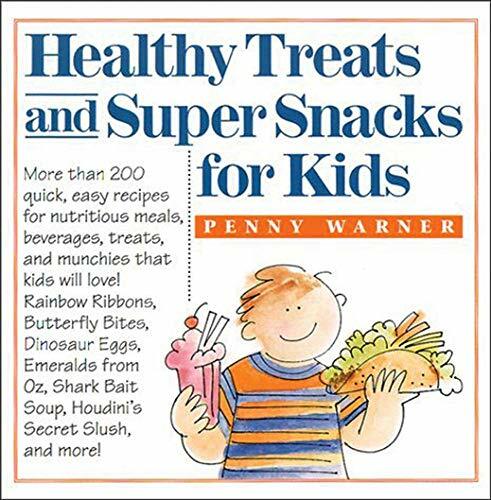 I expected some of this knowing kids love PB, but most of the recipes are inclusive of one of the 2 allergens my son has, so this book was a huge disappointment. If you're child is allergy-free, this book is for you. Nevertheless, it's still peanut-butter heavy. Given the incidence of kids with allergies in today's world, it would be great if more cookbook authors gave a section/chapter of their work to allergy-free recipes for kids. This is by far the best hors d'oeuvres recipe book I've come across. I use it time and again. And like it so much I've given it as gifts many times over! 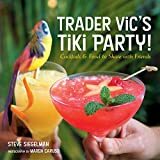 This is geared towards party recipes--- from drinks to demitast soup to finger deserts to all kinds of dips and snack mixes. Many will find here the ole reliables, and as I can determine, just about all of them--from Party Mix fame to Wassail to many ways of serving crab and shrimp dip. I particularly am attracted to the unusual, and there is plenty of that here. I enjoy such as Escargots A La San Diego, Goat Cheese Tortillas, and Papaya Stuffed with Curried Crab. This will assist those looking for some easy but delicious things to serve the party guests that will bring raves. 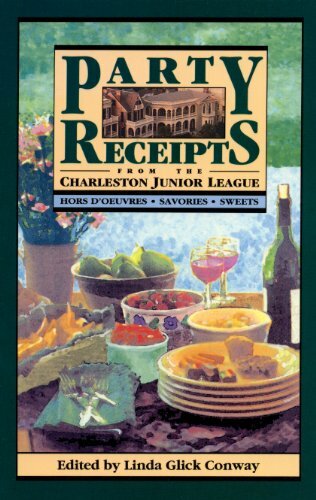 The Party Recipes from the Charleston Junior League is my favorite cookbook. Of all the cookbooks I own I always buy the ones that have lots of pictures. I usually like to see what it looks like first before I make anything. This cookbook was the exception, as it does not have pictures of the food. I looked through the cookbook and immediately saw at least 30 recipes that I knew I wanted to make. I couldn't put it down, as there was such a collection of recipes that I always wanted to try. Whenever I need a recipe for a party or gathering, this cookbook is always the first one that I pick up. I have never seen so many party favorites in one book. I also like the short comments with each recipe from the recipe contributor. The people of Charleston, South Carolina know how to throw a successful party. I'm glad they shared their most popular recipes in this book. 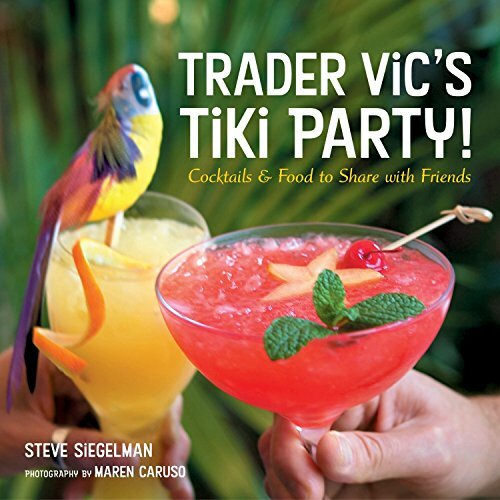 I use this book almost exclusively when making munchies for parties and gatherings. There hasn't been a single time that I've cooked from this collection that someone hasn't asked me if I could give them a copy of the recipe for a dish. I also have a gaggle of vegetarian friends, and this book is chock-full of veggie-friendly recipes, which makes everyone happy. I have dozens of cookbooks, but this one is, by far, my favorite. Chock full of great recipes. Sylvia Weinstock designs beautiful cakes. Sharing that opinion are OprahWinfrey, Donald Trump, and several Kennedys, among other clients of Weinstock's New York cake business. 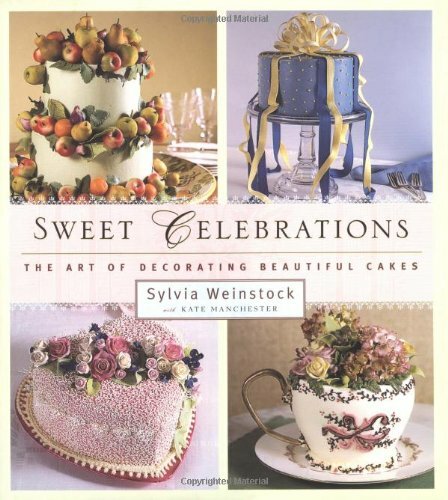 In Sweet Celebrations, Weinstock and coauthor Kate Manchester show readers how they can produce similar edible fantasies--bedecked beauties for all occasions, from weddings, birthdays, and anniversaries to bon voyages, bar mitzvahs, and baby christenings. Readers wanting to learn or refine cake-decorating skills, or those interested in this ever-evolving craft, will welcome the book. Weinstock is a master, the Da Vinci of cake decorationg! Her presentations are gorgeous. The recipes included are straight-forward. Not recipes for the novice but even if you never try to make one of the cakes it is a beautiful and nicely written book. No wonder the very wealthy come to her when they want a special cake. If I could afford it I certainly would! This book is a gem. I LOVED this book! Sylvia Weinstock is the most incredible cake decorator/baker in the world today - or maybe ever! I found the directions very straightforward and easy to understand. The photos show the fabulous details of the cakes, and the recipes range from easy to difficult. I couldn't believe that I actually made some of her cakes - I felt like an artist! I made the arzipan fruit cake, which was so much fun - I even got my kids involved! Everyone was so impressed, by both the look and the taste. This is a must-have for any baker - or artist! Thank you Sylvia. I was so nervous about whether to invest in this book (due to some of the reviews in here)I actually took it out at the library to check it out first. I was pleasantly surprised. It is true that the cakes featured here aren't that spectacular, so if you are looking for a coffee-table book on cake art, this isn't it. I saw only 4 or 5 cakes that stood out from the 40 examples shown. Some pictures in the book were used as filler, I guess...a few of these were nice cakes, but had no directions to go along with them. However this book offers so much still. First and foremost, it is for American cake enthusiasts. There is no rolled fondant here; (not that there is anything wrong with fondant, but culturally, here in the states-it is not something familiar.) It is a book that can be enjoyed by cake decorators of all levels and nationalities, since many cake styles/techniques are represented. Weinstock rates each cake featured as to its level of difficulty and gives good directions on how to complete each project. You don't need any fancy cake pans or special ingredients for the most part, to make these cakes either. I think that Weinstock probably wanted to focus on making a book that is more of a manual that anything else. The two main features of this book are the range of styles/techniques offered and the author's interest in motivating the reader to explore inventive possibilities on his/her own. The examples shown are well-known to cake novices...marzipan, cornelli lace, structured cakes, character cakes, white-on-white, basketweave, tier, gumpaste florals, and dotted swiss. The instuctions are clear and complete. Creativity is encouraged by showing one cake style and variations of that same style with additional photos. Although there is hope that Weinstock will find time to produce yet another book with a lot more fantastic visuals-perhaps adding some autobiographical data on her business (more information than she had in this book)...I think this is a useful book to have in any cake decorator's library just for the recipes alone. As someone with a long history in culinary arts, I know these recipes are good. This is a definitive textbook on cake decorating. I have been a cake designer for only a few years and have many books and recipes. The recipes and instructions in this book are amazing. The cakes are rated for difficutly and the first one I tried turned out great. She gives wonderful directions for the Italian Meringue Buttercream which can sometimes be difficult to make. All of the cake recipes I have tried are perfect. She gives a good variety of different types of cakes so that you have a lot of different examples to get ideas from. She has basic tiered cakes, including the very popular gift box type cakes. She also has round cakes, and many other sculpted cakes. There are also a lot of other pictures of cakes scattered throughout the book for inspiration. She gives great directions for making gum paste flowers and marzipan fruit. If I had to pick just one cake book to keep in my collection, this would be the one, hand down. I highly recommend this book. One Recipe Made Me A Fan! Weinstock's recipe for yellow butter cake was worth the price of the book. I'm not an experienced baker but was able to follow her recipe without a hitch. And the cake itself was THE BEST I've ever eaten (and believe me, I've eaten some cake!). In fact, friends and I first ate the cake plain --unable to wait for the icing! 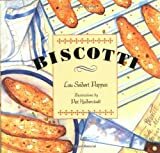 After trying several recipes from the book, The 50 Best Biscotti Recipes, and not liking them, I purchased this book and am in biscotti heaven! I just ate a slice of Biscotti Nocciole-Cioccolato, and it is excellent. I could dip this in melted chocolate, too! I baked Biscotti Toscani and Double Chocolate Decadence (with expresso coffee,) and both were mouth watering. Some of the prep time is lengthy, for I like quick and easy. But grating the zest of an orange, toasting the nuts, or making a little expresso is well worth the time. This a great book. The recipes are easy and the results are great. The cookies are not hard like the store bought ones. You can actually eat them without dunking them in coffee. I make them every Christmas as gifts and everyone loves them. This is a wonderful book and each recipe I have tried is outstanding. The Double Chocolate Decadance with roasted almonds and the Caramel Walnut are the best. 'My biscotti' is now requested and expected for every holiday or visit. My mother and sister both asked for this book for Christmas and now even more family and friends are enjoying the results. This Biscotti will keep your family and friends asking for more.I can't tell you enough about the Almond Crunch Biscotti, because it is that good.When you get finished eating one it is like the crunchiness and the after taste is so good that the biscotti actually has a spell on you and you just keep wanting more and more.And I am not joking when I make this biscotti everyone has said the same thing about the after taste making them want more.I love this book!! !And I try to keep some made because they go with everything from coffee to wine,so if someone stops over morning or night you have something to offer them.Plus they don't take long to make. Is there life after Triple Ginger Biscotti? Can there possibly be anyone left in the U.S. who hasn't heard of Mollie Katzen? Or if not Mollie herself, at least her first cookbook, the now classic Moosewood Cookbook? Few writers have reached so broad an audience with a healthy-cooking, pro-vegetarian message. Ms. Katzen's latest effort, Sunlight Café, turns breakfast into a healthy, fulfilling showpiece meal, a morning sanctuary for assembling the day. She explains how to do this, no matter what your time crunch or disinclination might be. And in an introductory essay called "Breakfast for Metabolic Health," she explains why. 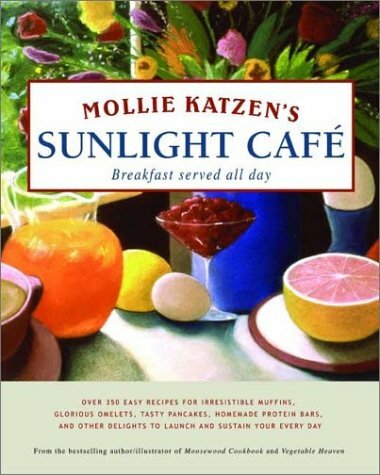 Mollie Katzen's self-named book 'Mollie Katzen's Sunlight Café' is a very welcome addition to the very small number of books available on breakfast. 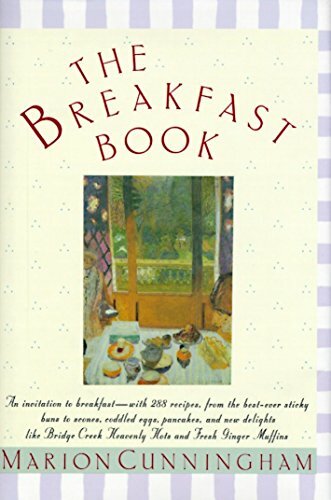 As I have just reviewed a classic, 'The Breakfast Book' from the widely recognized author, Marion Cunningham, it seemed only appropriate that I tackle this new breakfast book by an equally honored writer who is best known for her books on vegetarian cooking co-authored with the Moosewood Collective. Before I loose you in my usually long discourse, let me say that this book can do more good for your eating and health than just about any three other books put together. This opinion is based both on the quality of the book and the special position of it's subject. Most people give less attention to breakfast than to either lunch or dinner. This means that breakfast is the one meal where the room for improvement is the greatest. It certainly has a higher potential for improvement than lunch, as most people eat lunch outside of the home. Even if they carry lunch from home, the range of foods, which can be made portable without special equipment, is smaller than what can be prepared and eaten in ones own kitchen. This book is directed not only at a very wide range of good breakfast food, it is also directed at giving you the information you need to eat a nutritious breakfast with few or no 'empty calories. The book starts with a brief essay on how the body deals with carbohydrates, especially upon eating the first meal of the day, or, 'breaking fast'. The long and the short of this story is that you are much better eating whole grains with protein and good fats rather than sugars and quickly digested starches. The remainder of the book is dedicated to making this option appealing. Beverages: The straight skinny on coffee, tea, hot chocolate, and smoothies. Fruit, including fruit salads, dried and roasted fruits, and crisp or cobbler. Grains, Cereals, and Porridges, including an excellent tabular presentation of grain cooking characteristics. Muffins, Biscuits, Breads, and Buns, including all the classics plus great stuff with bran and whole grains. Eggs, Tofu, Scrambles, Quiches & Souffles, or Protein Central. Lots of basic methods. Potatoes, Beans, Tempeh & Hashes. Lots of Potato recipes and unusual hashes. Yogurt and Cheese: Lactose central with (mostly) ricotta and other soft cheeses. Puddings and Custards: Sweeten up your egg protein and vegetable goodness. The book is laid out with lots of sidebars on tips and techniques which make it very easy to read and to find what you are looking for. Each chapter title page gives a complete table of recipes in the chapter. Almost (but not quite) as good as a complete list of recipes in the front of the book. Be sure to check the index when you are looking for a specific recipe. French toast, for example, appears in Griddle Foods and not Eggs or Breads and Potato Pancakes appears in griddle foods and not under potatoes. The author wins me over completely when she quotes the line on omelets by Elizabeth David that says that the perfect omelet recipe is the way you make it. Another good quote describes an omelet as nothing more than eggs, butter, and body English. Of course, she goes on to give detailed instructions on how to make a good omelet and says it is not easy. Moral of the story, read and emulate her directions, but don't get too hung up on the result not looking like something done on the Food Network. Just keep practicing until you are happy with the result. Not nearly enough has been written about the economics of home cooking versus prepared foods. Ms. Katzen's recipe for granola is probably an excellent place to start. A quick look at the health food aisles of my local megamart shows designer brand containers with less than a pound of food for prices that would make a beef fillet blush. Granola is a product that is almost completely foolproof to make from ingredients that individually are very, very cheap. And, I checked out those same health food aisles in the megamart and I found every single ingredient in bulk. To repeat, Ms. Katzen's book is probably one of the very best places to start in improving what you eat. It is a very nice bonus that the list price of the book is significantly lower than the average cookbook and the artwork done by the author is truly delightful. Very highly recommended. Easy for people with little cooking knowledge. Mollie Katzen's Sunlight Café, is a beautifully produced book with original art by the author, and interesting mini-articles at the beginning of each section. (Katzen also has nice introductions and incidental notes within the articles that make them fun to read.) Many recipes include variations that make the book full of possible recipes and combinations. I especially liked the two introductory chapters about breakfast: "Make Room in your Life for Breakfast," which includes a short look at breakfast around the world, and "Breakfast for Metabolic Health," which discusses how breakfast contributes to our overall diet. The book contains over 300 recipes with sections on breakfast beverages, "Vegetables for Breakfast" and a delicious-looking chapter on "Potatoes, Beans, Tempeh & Hashes." Katzen states that most of the recipes take less than 30 minutes to prepare, and many take less than fifteen. Unfortunately, there is no nutritional information with the recipes, and only 3 1/2 pages on menu planning at the back of the book. Sunlight Café is also obviously designed for lacto-ovo vegetarians as it relies heavily on dairy and eggs, and many recipes are not suitable for vegan substitutions, although Katzen says you can always substitute soy milk for cow's milk. While there are vegan recipes in the book, they're not labeled, so vegans get the not unpleasant chore of wandering through the chapters soaking in all the interesting tidbits while picking out what recipes to prepare. I never gave much thought to breakfast, but Mollie Katzen sure has! And she is her usual contagious self in this unusual new volume, as she shares hundreds of ideas and many, many simple recipes with healthy undertones and delicious overtones. And speaking of tone, hers is never dogmatic or preachy, just very informative (with interesting asides and anecdotes) and personal encouragement, helping us realize just how important it is to have something decent to eat as early in the day as possible, and sympathizing with how difficult that is for many of us. It would have been easy to write a breakfast/brunch book oriented specifically to leisurely weekend entertaining, and although this book covers that (a nice list of user-friendly menus appears in the back) it mostly focuses on the challenge of a good breakfast on busy weekdays. I've tried about 6 of the recipes, and they have all been delicious. Try the Chai Oatmeal and the Wild Rice & Quinoa Muffins with Dried Cranberries. I also loved the Breakfast Gingerbread and the Homemade Chocolate Chip Protein Bars. A winner all around, complete with lovely full-color art by the talented Ms. Katzen! A bargain at the price offered here (and even a bargain at full price)! I already love Mollie Katzen--her lovely artwork and ideas about eating, however unorthodox--always inspire me to try new things. Sometimes these experiments are a crashing failure--but the winners make it all worthwhile! This book in particular has piqued my interest. I have not used the recipes, but I am reading and rereading it. I picked it up partly based on my interest in all of Mollie Katzen's books and partly because I had initially opened it to the page with the recipe for Vanilla Ricotta Muffins. "Just like Italian Cream Cake"...I can't wait to try it. Her breakfast menu suggestions are also giving me new ideas for making my breakfasts, especially on weekdays, more interesting, healthy, and imbued with "soulful intention." When it was first published in 1980, Maida Heatter's Book of Chocolate Desserts became a New York Times bestseller and then won a James Beard award. The book is Heatter's third, a mouthwatering compendium of superb but easily achieved chocolate cakes, cookies, pies, puddings, confections, sauces, and more. Like all of Heater's books, Chocolate Desserts balances good taste with warm, meticulous instruction that anticipates and addresses every question and concern a dessert-maker might have. Cooks at every skill level, from amateur to professional, will find Heater's recipes, and their results, a joy. I've had this book for 20 years and love it. I've made many recipes very successfully because the instructions are so clear. Particular favorites are the chocolate madeleines, the chocolate pumpkin cake and the combo of Maida's chocolate ice cream (it ain't brown, it's CHOCOLATE) and hot fudge. Yum! I've baked quite a few of the cookies and cakes from this book and they've always turned out great! The directions are always clear and Maida introduces each recipe with some background information, telling the story of how she came upon the recipe, what the finished product looks like, serving and storing suggestions, etc. These descriptions help when trying to decide which chocolate dessert to make when choosing from such a wealth of choices. I love the orange chocolate loaf cake and since Maida says the recipe can easily be doubled I always do. This cake goes quickly and it pays to have a spare! A friend of mine gave one of these recipes to her caterer for her wedding cake -- people are still talking about that incredible cake! I have many chocolate cookbooks that look better but not perform better. I lost my copy and it's like losing an arm. There is not a better chocolate cookbook out there. 6 stars? 10 would do this book justice. I've had this book for 20 years and made nearly everything in it. The only recipe which I think must have a mistake in it is the "pepper" brownies. I've never been able to make them come out, and I've varied the cooking times, the tempetature, the ingrediants etc. Ok, then the basic brownies, ooooh you'll never buy a box mix again. Then the flourless cakes, so rich, its incredible. On to the "Pots of Creame" Yum, you'll have people begging for more. The trick here is to use a pan to hold the pots in, put the pan with the pots in it in the oven, then add "boiling water" and cook for exactly 22 minutes. The centers will be smooth and look runny but they'll finish cooking as they cool. Also be very careful getting them out of the oven, hot water will go right through your oven mitts. I use a canning jar lifter to get the pots of creame out of the pan. But in any case please be careful the burn you could get is bad. I could go on and on, but if you can follow directions they all seem to come out fine. I wish I could give this a 6-star rating! The King Arthur company has produced flour and other baking ingredients of high reputation for over two centuries. Similarly trustworthy, and reflecting their years of kitchen experience, The King Arthur Flour Baker's Companion offers over 400 recipes for all kinds of basic and up-to-the-minute specialties--from pancakes and waffles to muffins and quickbreads; from coffee cakes, pizzas and crackers, to hearthbreads, cakes and cookies, including two complete chocolate chip recipes, for soft and crispy kinds. This is one of those books that no baking kitchen should lack--not only for its comprehensive repertoire and recipe dependability, but for the intimate ease with which it fulfills its promise. What this means, partly, is that technical information is perfectly pitched to ensure relaxed understanding, offering neither too much nor too little detail. It's the range and quality of these baking "backstories," including, for example, how to control cookie-dough spreading while baking, plus numerous hints and shortcuts, that help make the book so valuable. If you need a fantastic baking book on how to bake virtually everything, then this is the book for you! Most cookbooks out there fail to mention little things that are extremely important in a recipe, such as sifting flour, using eggs that are at room temperature, which type of oil to use etc. Most cookbook authors either know this information and figure you do too, or the author does not know these techniques and those recipes in those books are not all they could be. And most cookbook buyers know how to read a recipe, yet do not understand it. King Arthur Flour is a company that has been in business for over 200 years. It is their business to know flour, and to understand how to use it. It is also to their benefit to educate their flour buyers in how to bake better, so they will be happier with the end product, and thus buy more flour and even recommend their flour to their friends. 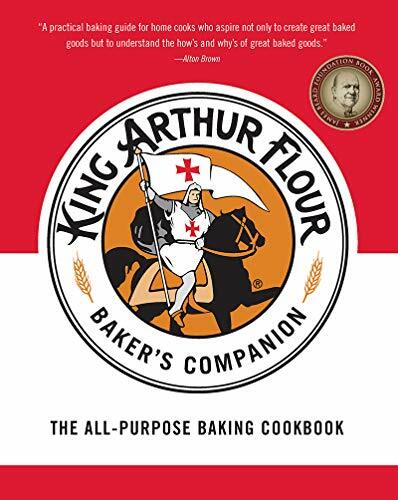 In their latest book: The King Arthur Flour Baker's Companion: The All-Purpose Baking Cookbook they explain why you need to sift your flour (it adds air to the mixtures which aids in leavening), why French Toast bread should be stale, why you only fry in certain oils and much more. They also offer recipes for virtually everything; from breakfast foods to quick breads, from doughnuts to yeast breads, from cobblers to cookies and cakes, as well as pies and quiches. This book even offers a section on which kitchen tools are the best for your baking projects: from type of chocolates to pie pans. This is a must-read section for any baker. This cookbook is designed for 90% of the cookbook buying population. This cookbook is fantastic as now you can understand what you are doing rather than just following directions. When you decide to make modifications to your recipes, now you will know what parameters you must maintain if you want your recipe to turn out. For example, almond oil will not work when frying doughnuts, as it has a very low smoke point. For the price of this book, you get more than what you are paying for. This is an excellent book and should be a standard in any home that has any baking! For added interest, King Arthur Flour offers free baking seminars across the country, as well as online classes. The King Arthur Flour Baker's Companion is an "all-purpose baking cookbook" collecting over 450 recipes showcasing some of the most delicious creations time, energy, flour, and a "will to bake" can make. Each individual recipe, ranging from Gingerbread Pancakes, to Brioche (a rich yeast bread), to Almond Stollen, and more, comes prefaced with a brief aside concerning the history and tradition of the baked good. Highly recommended for personal and community library cookbook collections, The King Arthur Flour Baker's Companion is far more than merely just another recipe book; it also offers a wealth of information about the history and usage of wheats, malts, herbs, spices, and more. Warning! This book is dangerous! Don't buy this book if you can't afford the time to bake for all the various groups who will be after your baked goods once you start using it. BTW it is not doing my diet plans any good either. I've made about a handful of the recipes in this book and have thought that most of them were quite tasy. Some were okay - the Lemon Bread was too dry I thought and the Chewy Chocolate Chip Cookies were crisp and not chewy (it turns out this is because of a typo and the recipe needs two eggs instead of one as stated.) On the other hand, I made my husband a Boston Creme Pie for his birthday and it was *very* delicious. Most of the recipes have been good. I also like the layout of this book. It's easy to find things, plus it's a cozy read. The book has a bit of a New England feel to it. I tend to like cook books that you can sit and thumb through and think of future baking projects and this book is definitely that way. There's a lot of interesting information about how to bake something better. I don't know if this the end all book on baking, but I do find that I'm reaching for this book more than most of the others I own. The only thing I don't like about it is the use of shortening for many of the recipes. I tend to prefer baking with butter. This is only a personal preference though. Overall it's a usefull book to own. This volume, subtitled the 'All Purpose Baking Cookbook' perfectly fits the criteria I typically apply to a book in order to decide if I want to give it five stars. A book gets three stars if it meets my expectations. A book gets four stars if it meets my expectations in a very successful way. Typically, that means that it has few or no detected mistakes. A book gets five stars if it exceeds my expectations. This book certainly exceeded my expectations. What I anticipated when I opened this book was a dry, technical work steeped in discussions of the effects of gluten and altitude and humidity on bread making, similar to some of the more detailed parts of better books on bread baking. All of these discussions are here, plus others on the finer points of measuring flour and types of flour, but with a difference. The biggest surprise in the book was the light, personal touch of the writing. It all has the tone you may expect in a very good book on regional cooking. And, lo and behold, there is a hint of regionality and local tradition in the selection of materials in the book. In spite of the fact that King Arthur products are available throughout the country (unlike White Lily, for example), the book retains a very New England tone to it's selection of recipes. One prominent example is in the recipe for biscuits, where it advises all experienced Southern biscuit makers to simply skip that page, as since 'we don't want to shock you with the way we make biscuits up north'. That doesn't mean the book does not touch on every subject you may expect it to cover. As I said in my opening paragraph, it easily covers much more than what I expected. The very first chapter dealing with breakfast foods covers material not commonly covered in conventional baking surveys. Pancakes, waffles, crepes, French toast and their allies are not covered in either of my favorite general baking books (Julia Child's 'Baking With Julia' and Nick Malgieri's 'How to Bake'). If that were not enough, it presents recipes in such a way that you can prepare baking mixtures ahead to much the same effect as if you were laying in a supply of Bisquik. One of the secrets is in the use of dried buttermilk. I have seen this product in my local megamart, but have not until now had a clue as to how to use it. The homey, comfortable feeling of the book extends to even that most difficult subject of breads made with wild yeasts (Sourdough, Pain au Levain). The book does not cover every different type of artisinal bread you may find in such books as Carol Field's 'The Italian Baker' for instance, and it does not cover such important French specialties as brioche as deeply as Rose Levy Beranbaum's 'The Bread Bible', but it does cover them, and so much else as well. Another contributor to the warm feel of the book is the layout. Pages are airy with well positioned sidebars, titles, and tables. Technical information is always at the same place, accessible, but unobstrusive to the browser. In the long run, the greatest value of the book is in it's encyclopediac coverage of just about every kind of baking you can do, extending the definition of baking to things outside the oven to include the griddle (pancakes, crepes, etc) and the deep fryer (doughnuts, beignets, etc). In fact, just about the only product made with wheat flour which this book does not cover is pasta, although it comes very close in it's chapter on dumplings. The more technical aspects of the book are quite up to snuff in spite of the warmth of the presentation. Where appropriate, all measurements are given by both weight and volume. The importance of measuring by weight is also discussed in detail at the beginning of the book. The book also includes a nutritional analysis of each and every recipe, giving portion size, calories, fat, protein, complex carbohydrates, dietary fiber, sodium, potassium, vitamin A, iron, calcium, and phosphorus. I'm impressed. I confess that it is slightly easier for this book to provide this as they can make the very safe assumption that it is their brand of flour which is being used. The sixty pages on ingredients at the end of the book are easily worth the price of admission all by itself. It is no surprise that it gives a deep discussion of wheat and flour. What is surprising is that it also gives fairly detailed discussions of other products used in baking such as milk products, eggs, fats, sugars, fat substitutes, and sugar substitutes. The very nice section on baking tools is an equally valuable resource. In one page the book gives you everything you may see in a much larger three page article in 'Cooks Illustrated'. I am really amazed at the value you get for a list price of $35 for this book. Just consider a comparison to an Ina Garten book 1/3 as long with much less authoritative information for the same price. Amazing. I am not at all surprised to see an endorsing blurb on the back cover from Alton Brown. I strongly suspect that he will be cribbing material from this book for one or more 'Good Eats' shows, if he has not already. The only thing I find missing in the whole book is a decent bibliography. This type of encyclopedic reference really deserves one. All traces of willpower dissipate somewhere between the rich, moist, and chewy Cheese Cake Brownies; the delicate, crispy Palm Beach Lemon Cookies; and the flaky, tender Portland Fig Cookies, bursting with an unbelievably decadent filling of dried figs, currants, walnuts, and spices. 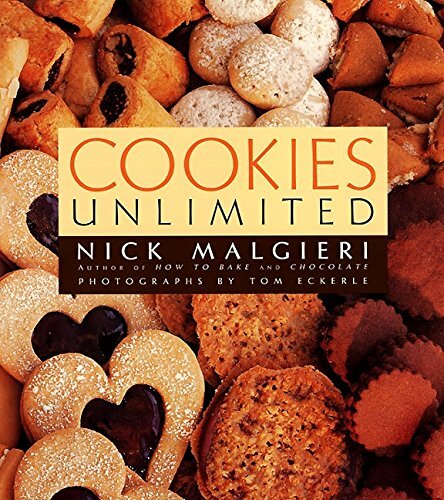 Trust Nick Malgieri, award-winning author, James Beard nominee, and director of the baking program at Peter Kump's Cooking School in New York, to gather a collection of more than 350 cookie recipes that we can't live without. Each mouthwatering recipe begins with a short introduction. Sometimes Malgieri tells us what the cookies will look and taste like, sometimes he tells us a bit about their origins, and sometimes we meet the people who first shared the recipes with him. In each case he is sure to piqueinterest. If Malgieri says that nothing is homier or more comforting than his old-fashioned moist Currant Squares, how can we not make them on the next cold, rainy Saturday that comes along? And if he says he helped Pierre Hermes (the famous Parisian pastry chef) make his extremely delicate Orange Tuiles, and that it wasn't difficult, that should be enough impetus for us to make them just to impress our friends. Malgieri has divided the book into chapters by type of cookie (bar, drop, refrigerator, rolled, molded, piped, filled, etc. ), just what we'd expect from a great teacher like him. The chapters begin with hints and tips for the kind of cookie and recipes follow. If we had lots of time, and plenty of hungry friends, we could work our way through the book and arrive triumphant, at the end, master cookie makers, but we're probably more likely to skip around a lot--everything sounds so tempting! From "heavenly" Caramel Pecan Cookies and "elegant" French Vanilla Sables to "delicately flavored" Little Italy Pine Nut Macaroons and "nutty, fragrant" Almond and Hazelnut Biscotti, Malgieri's enthusiasm for his subject is contagious. This is a fantastic assortment of Cookie recipes all in one place. I've tired the "Supernatural Brownies", Blondies, Gingerbread People, "W" piped cookies, Cinnamon piped cookies and Cream Cookie(Rolled) ALL with GREAT results! This is a true cookie resource as the assortment of cookies covered is amazing... fried, molded, rolled, bar, dropped, shaped, piped and filled. The ingredient list and instructions are clear and precise. The paper/binding of this book is high quality. There are beautiful color photos that show you most of the mouthwatering cookies too. If you're looking for the ultimate cookbook on cookies, you've found it. I love Nick Malgieri, his recipes, his way of explaining step by step what to do. This book is no exception... every recipe is great, it's filled with pictures and illustrations when necesary. A beautiful looking cookbook, certainly. I was very excited to try the recipes after receiving the book for Xmas. But what a disappointment. Tried 14 different recipes with fellow baking friends over the course of a week. They weren't bad, but we six bakers let out collective "ho-hums" with each. 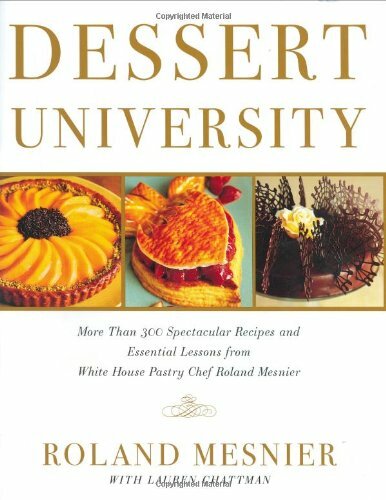 I am a professional pastry chef and I found that most of Mr. Malgeri's recipes are avaiable in many other books ...in other words they are neither unique or unusual ...and many of the recipes are just not very good representatives of their "TYPE"...I would not recommend this book. I would recommend "The Good Cookie" by Tish Boyle...better recipes and better writing! Don't take Nick Malgieri and his bad behavior personally. He is a miserable human being and everybody in the industry knows this about him. You were not the first and certainly not the last to be dissed by him. However, being a former professional student of his, I can tell you that he really knows his stuff and his recipes are great. I graduated his cooking school with high honors, yet he made me and my classmates feel like complete imbeciles during the time he personally instructed us. Ironically that was the "cookie" part of our petit four training.